World Record Whitetail: You can except to see trophy caliber whitetail that range from 130" to 190" on any given day. 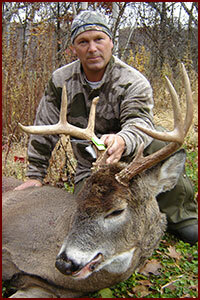 We have multiple tracts of strictly managed un-pressured premium whitetail properties. Bluff Bucks Outfitters attains over 4,000 acres that have been QDM since the 1980's. Each stand location is remained fresh until you arrive to ensure the most phenomenal opportunity at a world-class whitetail. We consistently maintain each exclusive property year round with food plots, seasonal shed hunting, build watering holes, and create new mineral sights. Hundreds of pre-set stands are already hung, posted, and ready for you. You will be happy to hear that we provide an assortment of stand methods for your convenience, such as ground blinds, towers, 2-man ladder stands, hang-ons, and much more. We are highly conscious about hunting specific stands under certain circumstances. Time of year, food sources, wind direction, trail-cams, deer behavior, weather patterns, and so much more are calculated daily to ensure you're in the most desired location. 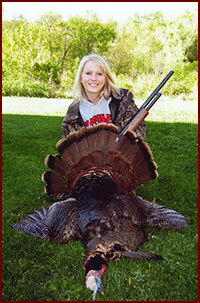 Bluff Bucks Outfitters specialize in providing you a remarkable Eastern species wild turkey hunt. We have over 4,000 acres of prestigious turkey hunting grounds in Zone #1. Your turkey hunt will be pre-scouted days before you arrive to ensure your hunt will be outstanding. Our turkey hunts have been nearly 100% success over the last 4-years and are perfect for a father/mother, son/daughter combination. We will do everything we can to put you in front of a mature Buffalo County, WI gobbler. The non-resident need not worry about drawing permits because they can be obtained over the counter. Please contact us or (click here) for further information about turkey hunting. We are pleased to offer you Buffalo County, Wisconsin's first five star hunting lodge, featuring trophy whitetail and exceptional wild turkey hunts. 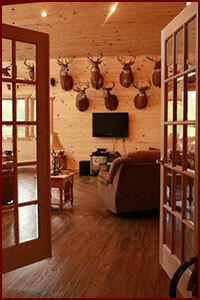 Come and experience your dream hunting retreat on our majestic Mississippi River bluff's estate. Combine the ultimate hunting experience with a five star atmosphere, and our professional staff, provides the superlative outdoor refuge for you. Nestled in the rolling hills and beautiful mixed hardwoods of Western Wisconsin, our scenic setting is truly an outdoorsmen's haven. Bluff Bucks Outfitters dedicated years of devotion to the prime management of our herd and treasured land has allowed us to offer once in a life time world class trophy whitetails hunts. You will sleep in one of our luxurious private cabins, which makes for a delightful rest. The cabins are fully furnished and have everything you'll need during your stay. Meals and Lodging included with all hunting packages. 1/2 of the hunting cost is required when your hunt is booked; the rest of the cost is due by August 1st. PLEASE CHECK THE WISCONSIN DNR'S WEBSITE FOR ANY CHANGES.